At the opening of Surecare Hertfordshire, from left: carer Soutonye Isaacs, Helen Roberts, Karen Carroll, Alan Plancey and Kevin Isaac. Karen Carroll, a qualified care professional with over 30 years of experience in the NHS has opened Surecare Hertfordshire. 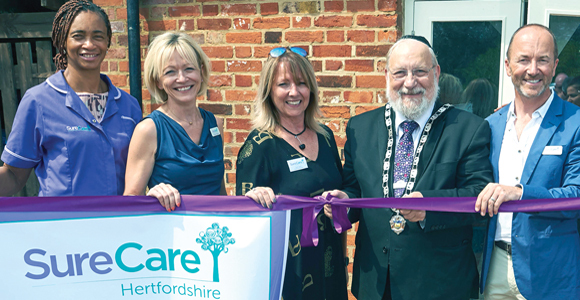 The new branch based at Barnet, officially opened by Alan Plancey the Deputy Mayor of Hertsmere, will offer a range of care services such as person-centred care for the elderly and vulnerable, home services and staffing solutions for care homes. Carroll is joined in the business by Helen Roberts, who has management experience and has worked for a European manufacturing and distribution company, and Kevin Isaac, founder of a local financial planning and wealth management business. Using their combined skills, Roberts will manage the day-to-day running of the business working alongside Carroll, the registered manager, who will be responsible for the quality of care services. “We make sure that our carers have the time that they need to not only fulfil our client’s care needs but also to be their lifeline to the world at a time when they may not be as mobile as they once were. SureCare says that it is fully regulated by the Care Quality Commission and has over two decades of experience in the personal care sector.